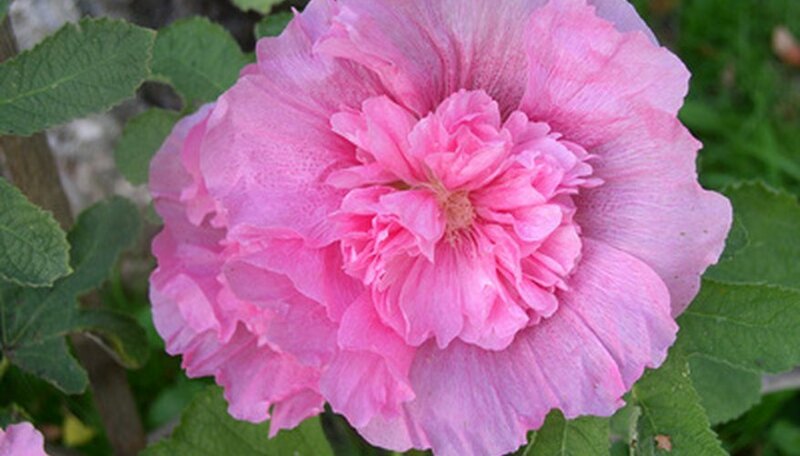 Alcea rosa, or hollyhock, is a member of the mallow family of plants. The species is native to southwest and central Asia. Hollyhock is easily recognized by its tall spikes and abundant round cup-shaped flowers that bloom in shades of pink and red. The flowers are ruffled, double variety or single petaled. Hollyhocks are not easily transplanted because of their fast-growing, long root structure. Hollyhock spikes grow 4 to 8 feet tall on a root structure with a long main taproot. The taproot has short stolons, or side crown-buds, at the head of the root system at the soil line. It is classified as a perennial plant, but is often cultivated as a biennial. Dandelion, foxglove, aquilegia and delphinium also have this type of root structure. They grow as biennials because the crown-buds on the root structure are easily dislodged when the tall center spike blows in the wind or is disturbed at the soil line. When the crown-buds at the top of the root system are not disturbed by rain or wind, the hollyhock growth cycle is completed in 2 years. It sheds seeds from flowers that grow individually or in clusters along the main stem. Each flower is 3 to 5 inches wide when fully open. It has five petals, five sepals, six to nine sepal-like bracts and a columnar structure in the center which contains the reproductive system of the plant. Crown-buds at the top of the hollyhock root structure must be well protected by loose soil or sand as the plants begin to grow in spring. They need well-drained soil to prevent rust disease problems that commonly develop on leaves. Hollyhocks need light on their lower basal leaves and do well when planted in groups by themselves. Woody ornamental shrubs nearby will block the needed light. Hollyhock seeds germinate easily and are carried on the wind to propagate in uncultivated areas. They grow well in sun to partial shade and adapt easily to a variety of soil conditions. Common habitats include railroads, roadsides, vacant lots and waste areas. 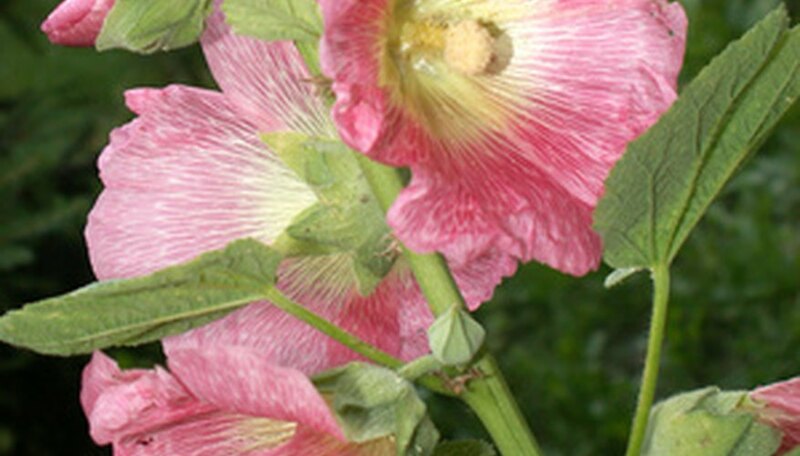 Hollyhocks have spread in the wild over most of the United States and eastern Canada. Hollyhock roots have traditionally been used as medicine. It is a demulcent and an astringent that is used for soothing inflamed mucous membranes and externally as a poultice for skin wounds. In traditional Tibetan medicine, crushed hollyhock root is used to treat kidney and uterine inflammations.The seeds and flowers are used as treatment to improve blood circulation and for chest problems.